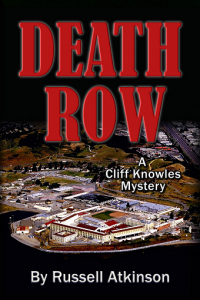 Death Row — Cliff Knowles Mystery #4 now available! Death Row, the latest installment in the Cliff Knowles Mysteries is now available for pre-order from Amazon in Kindle format. It will be delivered October 1. See link below. The print version (paperback) is expected to be available from Amazon about that date as well, but you can order it directly from me now at a discount and with free shipping (U.S. only, sorry). I now accept PayPal/credit cards. When a court ruling once again halts the carrying out of the death sentences of hundreds of condemned murderers, a frustrated vigilante organization decides to take matters into its own hands. In a mysterious and grisly act of horror, San Quentin’s entire population of condemned prisoners is executed in the dark of night. But how? And who are these vigilantes? Answering those questions falls to retired FBI agent Cliff Knowles, now a successful lawyer. His lover, Special Agent Ellen Kennedy, is intent on completing a geocaching challenge known as the Fizzy Challenge, but inadvertently turns Cliff into suspect number one by going for one cache too many. She has no doubt Cliff is innocent, but he’s kept a secret from her. He’s kept a secret from everyone – and he knows that her faith in him is misplaced. His only chance of keeping Ellen in his life, perhaps even of staying off death row himself, is to get to the critical evidence before the FBI does. This entry was posted in Uncategorized on September 21, 2014 by Russ. 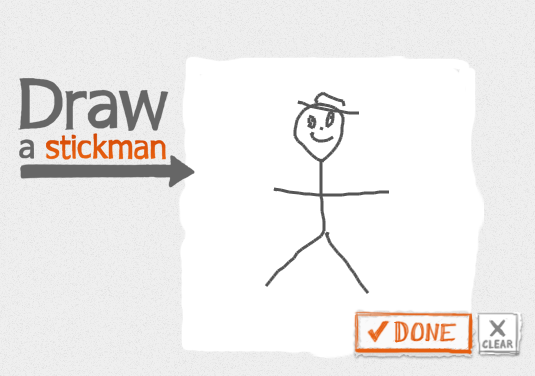 If you want to know the title of the next Cliff Knowles mystery, you’ll have to draw another stickman. This entry was posted in Uncategorized on September 20, 2014 by Russ. I’ve wasted about three hours now trying to buy socks. Socks. Plain brown dress socks. It’s bad enough that after spending half an hour I had to settle for buying women’s black socks, but I couldn’t find even those in brown. I’ve got small feet. Very small feet. Size 6-1/2 shoes, to be exact, even though I’m just a smidgen under six feet tall. If you try to buy socks in any department store men’s wear section they always come in a one-size-fits-all package. The only ones Target had were labeled as fitting sizes 6 – 12, so I finally bought some. Get real. If lingerie makers did that you women would be buying bras marked “fits sizes 28A to 44DD”. I got home, opened the package, discarded the plastic rack and sticky wrapper, and tried a pair on. The shaped heel bagged out over the top of my shoes in back, right on the Achilles tendon. Not even close. The women’s socks allegedly fit sizes 4-10 (women’s). Since my feet are size 8-1/2 in women’s sizes, these actually fit just fine. People may think I’m a cross-dresser if they look close, but I already wear women’s hiking boots and running shoes, so maybe I am. The only manufacturer of men’s footwear I know of that makes something exactly in men’s size 6-1/2 is Converse. I have some men’s All-Stars and love them since they are the only shoes I own that are actually my size. Anyway, today I returned the brown socks and made another try, this time checking out the boy’s section. There they had a package of dress socks that supposedly fit sizes 3 – 9. That’s ridiculous, too, but at least my size is right in the middle of the range, which means they do fit me. However, they were black, and I don’t need more of those. No brown ones, although there were many varieties in bright colors and Power Ranger or other super-hero-themed logos to choose from. So I finally gave up and drove across town to the Men’s Wearhouse. They had brown dress socks all right, but they were listed as fitting sizes 7-12. They didn’t even pretend to cover my size. I asked about boy’s socks. They had some – black ones. Sigh. Then the clerk went in back, dug around, and came back with some boys’ socks in brown that fit sizes 1 – 6. No chance. Double sigh. I gave up there and went to a tailor in the same shopping center. Nothing there in my size. I eventually gave up, defeated, and returned home where I dug out from the wastebasket my old brown socks with the transparent heels. Sometime in the ancient past I found some that more or less fit and I suppose I’ll have them until I die. The undertaker will need them. Now I’m curious. How rare is my foot size for an adult? Help me find out by taking this simple 3-question anonymous survey. This entry was posted in Uncategorized on September 19, 2014 by Russ. This is the best book, or at least the most exciting, I’ve read in a long time. It begins with a series of intense surgical scenes that could only have been written by a surgeon, a urologist, to be specific. The life and death moments, mostly death, had me on the edge of my chair for the first half of the book. Then it turns into a murder mystery of sorts, with a scary, creepy believability to it that sent chills up my spine. I hope I’m never treated at that hospital! Two more big surprises caught me off guard before the final denouement. The writing is clear and crisp and intelligent. I highly recommend this book. This entry was posted in Uncategorized on September 16, 2014 by Russ. Need I say more? This blog is about words. This entry was posted in Uncategorized on September 13, 2014 by Russ. I am no gamer. I proved that with this one. My skills at finding hidden objects (pixel hunting) are as bad as my skills at finding geocaches. I really enjoyed this game, though, and recommend it for those who appreciate wit and nostalgia more than blowing away Nazis, Aliens, or Zombies. The Tex Murphy Games of the 1990s were wonderful, warmhearted spoofs of the hard-bitten detective genre set in a post-apocalyptic San Francisco. Then Microsoft acquired the game company for its golf and other sports games and dropped the Tex Murphy series. 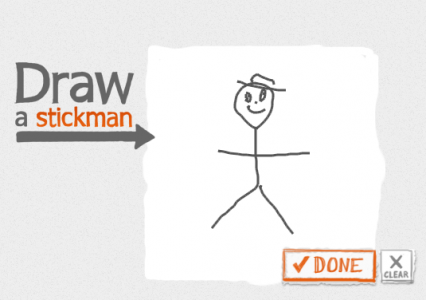 The original creators recently got the rights back and created this game in the same style. Some of the actors, including Tex (Chris Jones) are showing their age, but the new game had the same look and feel, the same self-deprecating wit, and same mostly non-violent, non-pornographic/sexist, non-grisly/gross content. The game play is fair, with hints available if you need them, although some of the hints are pretty obscure (e.g. “Find the hammer on Level 3.” Hey, I’ve searched Level 3 a bunch of times. Where’s the &^%$ hammer?) This is probably the only game review I will ever do in my life, so it’s significant that I enjoyed the game enough to write this. This entry was posted in Uncategorized on September 12, 2014 by Russ. This entry was posted in Uncategorized on September 9, 2014 by Russ. In a life-imitates-art moment, a 6-year-old boy was attacked in the Picchetti Ranch Open Space District (OSD) in Cupertino yesterday (September 7, 2014). This is only about three or four miles from the location of the mountain lion attack in my novel Cached Out. His parents fought off the lion. The boy is doing well. I’m not sure how libraries or others classify this book, as science fiction or spy thriller, but it is a bit of both. The lead character, Wyman Ford, is a James Bond-like figure, quite over the top, but good fun if you accept that going in. The plot is imaginative and the action scenes superb. The author appears to have done a good deal of research on astronomy and seamanship off the Maine coast among other things. The story bordered on the plausible at all times. The characters are really too one-dimensional, either good or evil, and the good ones impossibly smart and knowledgeable about virtually everything, which makes this disturbingly close to comic-book quality, but I enjoyed it. I listened to the CD version. At first I didn’t like the reader as his voice is a bit coarse, but he turned out to be a good actor and did the book justice. My one big complaint is that the language and characters were unnecessarily crude throughout much of the book, with numerous racial and sexual epithets and descriptions on top of the usual obscenities. This entry was posted in Uncategorized on September 2, 2014 by Russ.